Top-rated Good Sam Park just 2 miles south of I-10, Exit 20. All concrete roads & sites with free cable and WI-FI. At the entrance to Creole Nature Trail. Great tourist base for all of SW Louisiana. Clubs & Big Rig friendly. Easy in Easy out. We only stayed overnight but would stay longer. Some turns are a little tight but manageable. Good pull thru pads. Park is clean and well maintained. We stayed here only one night. Kind of easy to get to (road to bumpy, not their fault). Friendly staflf, gave us a lot of information of things to do in the area. Overall clean but the grass could use some mowing. Easy to get in but very difficult to get out in a big rig - not instructions in how to exit. Pool was nice. Kind of a noisy place (loud music being played by residents), quieted down around 10pm. People park their big trucks all over the place interrupting the flow of traffic inside the camp especially when you're trying to leave in your big rig. No, I will not stay there again. We didn't use restrooms nor laundry. Wifi is so so. Excellent and clean Park. Basically quiet. Friendly staff. This is a very nice, quiet, clean, facility. The grass is nice and well-manicured. The park is big rig friendly with level concrete sites. Utilities worked well. Wi-Fi was good. Roads are paved and easy to navigate. The staff was extremely friendly and welcoming. Trash is picked up daily. The office is open 24 hrs a day. We would definitely stay again. One of the cleanest places we have ever been to. Beautiful stocked lake. Adult pool area was relaxing and clean. Staff was very friendly and helpful. Cant beat it, especially for the price. We would stay again if in the area! Just an overnight on the way home- but would seriously consider stopping for a longer stay if we're ever in the area. Stayed in a 45 motorhome. Not friendly to big rigs (above 40 ft). There are difficult turns that have very large boulders placed to keep vehicles off the grass. Unfortunately they are way too close to the corners. In addition, the corners are more than 90 degrees. The sites are big enough with concrete pads. This was our first time staying here and it did not disappoint. Check in was easy. Even gave us tips and guides for the area. Big plus! Nice, level concrete sites. Grass very well maintained. Free Wi-Fi and cable. Very clean with daily trash pick up. Nice and quiet. Will definitely stay again when in the area. This is one of the nicest, most reasonably priced parks we have stayed in. The park and facilities are very clean and well kept. The staff is friendly and helpful. Easy in, easy out, level concrete sites with nice grass and picnic table. Cable and wifi. Our two little dogs were welcome and we could put out our portable pet fence. 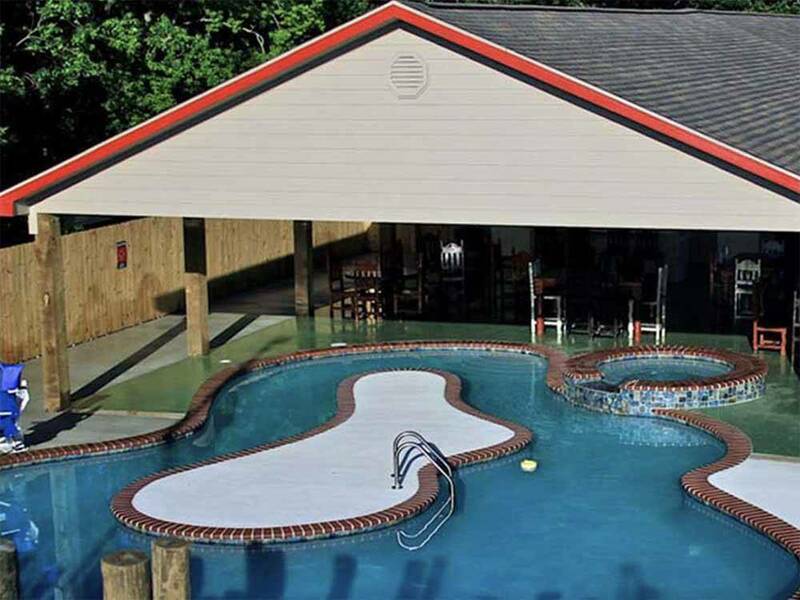 More and nicer amenities than most higher priced rv parks. Other parks could take a lesson from this park. 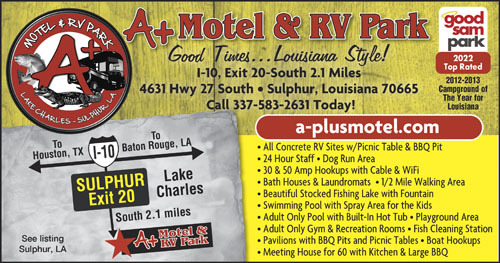 If you are in the Lake Charles/Sulphur area, this is the place to stay.